Perseus the beginning | Learn about Greek Mythology,Greek gods,Greek mythology stories! On the island Seriphos, a day that the wind blew strongly, washed ashore a wooden chest.It was found by a fisherman, when he open the lid he was surprised to see inside a woman with a baby in her arms. She was the royal Danae with her ​​son, Perseus. Danae was locked up by her father to prevent her by getting pregnant.However,Zeus transformed into goldern shower managed to get her pregnant. King Acrisius,the king of Argos, closed them in a chest, because he was told by an oracle that he would be killed someday by his grandson. Because he could not bear to kill his daughter and his grandson, Perseus, so he put them in a chest and threw them into the sea. The fisherman took Danae and Perseus to the king of the island, Polydektes, who treated them very kindly and generous. When Perseus grew up he became a clever and strong young man. But he was not happy, because Polydektes wanted to marry his mother. But she did not want him at all for her husband, although she felt very grateful to him. Polydektes believed that if he could get rid of Perseus, Danae would change her mind. 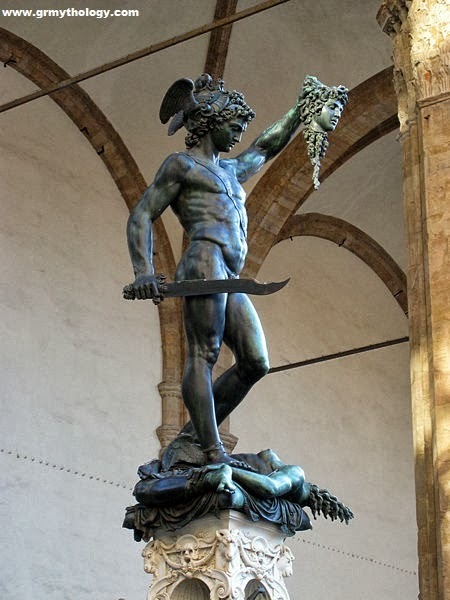 Well he called Perseus and told him friendly: "Perseus, you live many years in my palace and you have grown up. It is time to prove how brave and strong man you have become. I want you to bring me the head of the Gorgon Medusa."